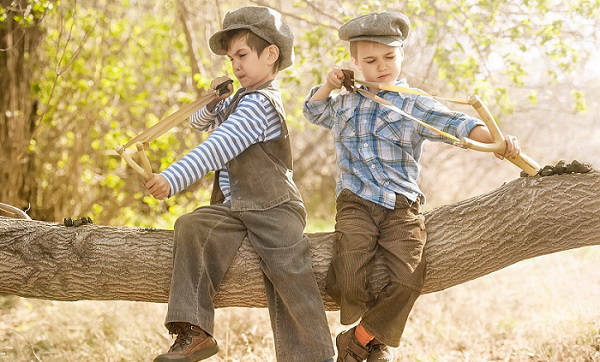 A slingshot has been often seen in the hands of kids and is mostly understood to be toy item. However, it is quite an effective weapon. Also known as shanghai and a catapult or katty in the UK, the slingshot is a small hand powered projectile weapon. A traditional slingshot features a simple design but possesses strategic power. The slingshot is kind of an extension to our own hand. It adds to the power exerted by our hand and we can throw stones or similar items at a better distance and improved force. As mentioned earlier, a slingshot is based on a very simple design. It has a frame that resembles the letter ‘Y’. Between the uprights of the frame, there are two rubber strings that lead back to a pocket that holds the projectile. Tracing back to the earliest types of slingshots, it is learnt that they were invented in Russia. It was known by the name of ‘rogatka’ in Russia. The name was derived from the word ‘rog’ that means horn in Russian. The slingshot was invented to be a smaller version of an actually bigger weapon known as the ‘rogatina’. This bigger weapon was used in ancient Russia. The classic design of a slingshot depends on the availability of vulcanized rubber. The rubber was commonly obtained from the inner tubes of the tires. This fact indicates that they may have been developed after 1888. Since it was a smaller version of a similar bigger weapon, it was forts used as a toy by boys. This may explain why people still commonly believe it to be a toy. However, the reputation of the slingshot changed from a toy to a weapon just shortly after the Second World War. It was not difficult to make a slingshot all on your own given its simple design. People used to make the frame from a forked tree branch and add red rubber inner tubes. Some time passed by and the inner tubes had carbon-black added. This addition made them less elastic. The commercial versions of the slingshot were available from very early on but Wham-O came up with their first product as a slingshot in 1948. In 1954, a modern wrist braced version of the slingshot was produced known as the Wrist Rocket. The Wrist Rocket Company was later renamed to be called Trumark. 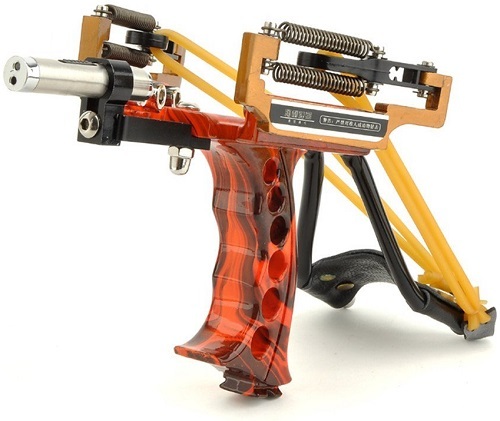 The company was responsible for two major innovations in the slingshot during the middle 1950s. One was the wrist brace while the other was the use of surgical rubber tubing instead of flat bands. They were slid over the tips of a backward facing fork ends. They were held by friction or the addition of liquid rosin. Nowadays there are enormous variations and designs of slingshots. Some of them serve one purpose while other another. It is often not as easy as it sounds, especially for beginners, to choose a perfect slingshot for them. Therefore, we compiled a list of the 10 best slingshots on the market that you can compare and choose the one that fits your needs the best.